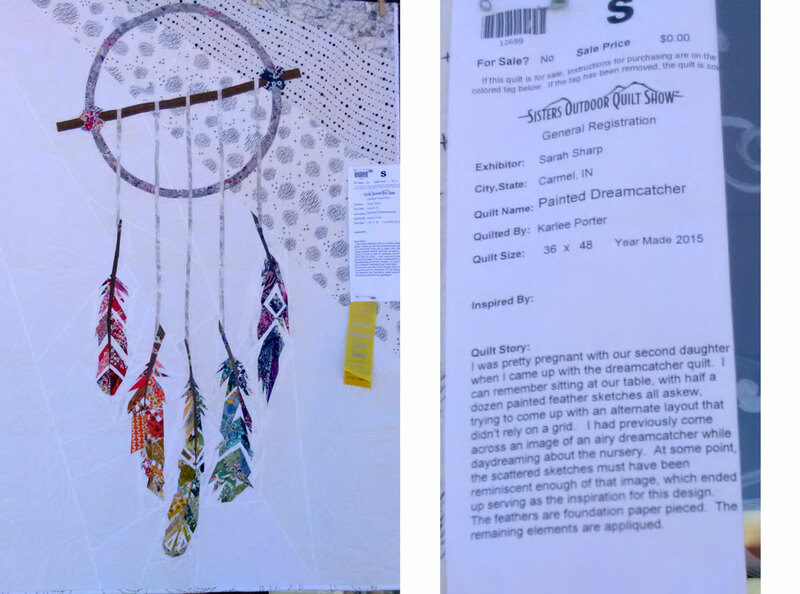 I was super lucky to be able to go to the Sisters Outdoor Quilt Show last week! What an amazing show – I’m so thrilled I was able to go see it!! If I could drive the whole 3.5 hours there and back through the mountains. If my exhaustion levels would hold up through a day of seeing many people. If my digestion could tolerate the time changes and food options. If I would swell up in the heat. If I could hold my anxiety in check. I have to say that I did much better than I expected – even through massive traffic on the way down making my trip closer to 5 hours in the car, I made it there with only a bit of anxiety on the road (steep mountain curves with strobing sunlight through the trees). I would have ridden the bus down if I didn’t have such bad motion sickness. The best part of the trip was getting to know a few of my guild friends a little better – they were great fun! We sewed together and ate together and laughed a lot. It was really sweet. Everyone had a project and it was nice to discuss the thoughts behind the quilt making. 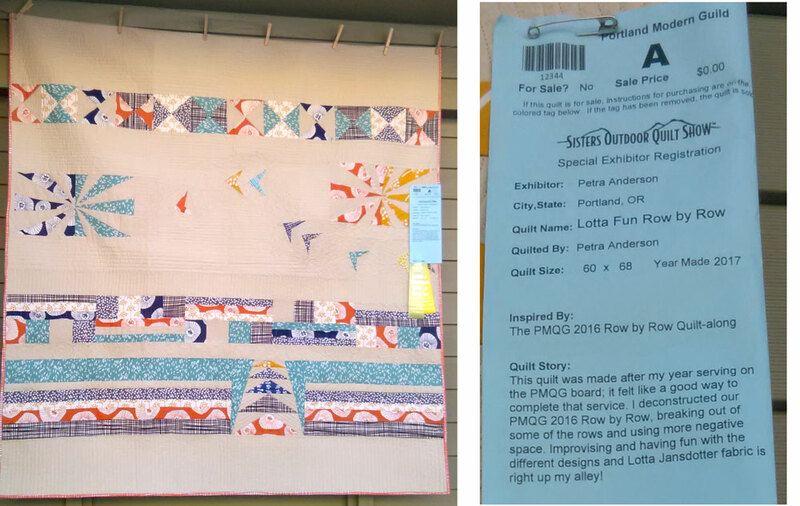 Sometimes our guild meetings are so big, we don’t get to hear about the whole story behind the quilt, so I really enjoyed getting to know these ladies a bit better through their creative process. Totally fun!! However, I forgot all my nighttime pills/suppliments so I did not sleep well, and we had plans to meet more friends around 7:30am, so I was up early – and if you know me, this is much earlier than I’m used to. Since I wasn’t sleeping well anyway, I decided to enjoy the morning – and it was beautiful! It was even a bit chilly, so it was an easy, gorgeous drive into Sisters. Once I was there, I was happy we left early – the temperature was warm in the sun, but not bad at all! 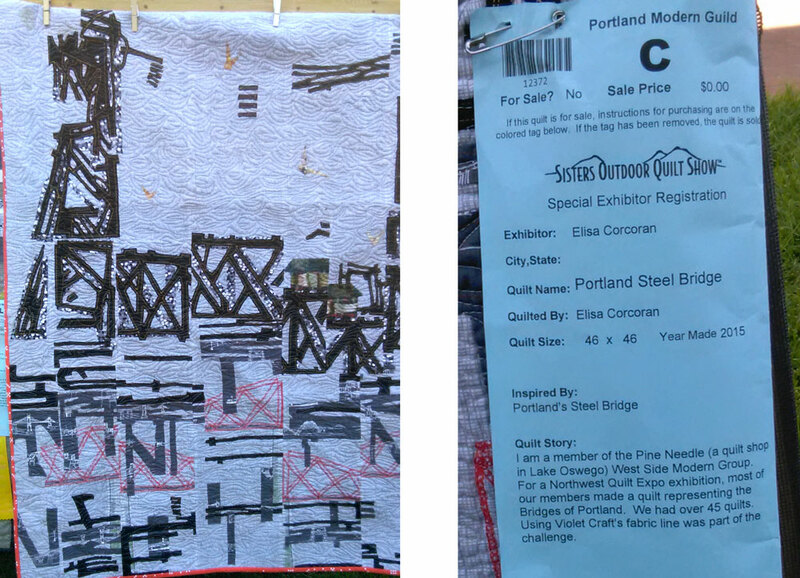 The show was great, I saw a lot of inspirational quilts! 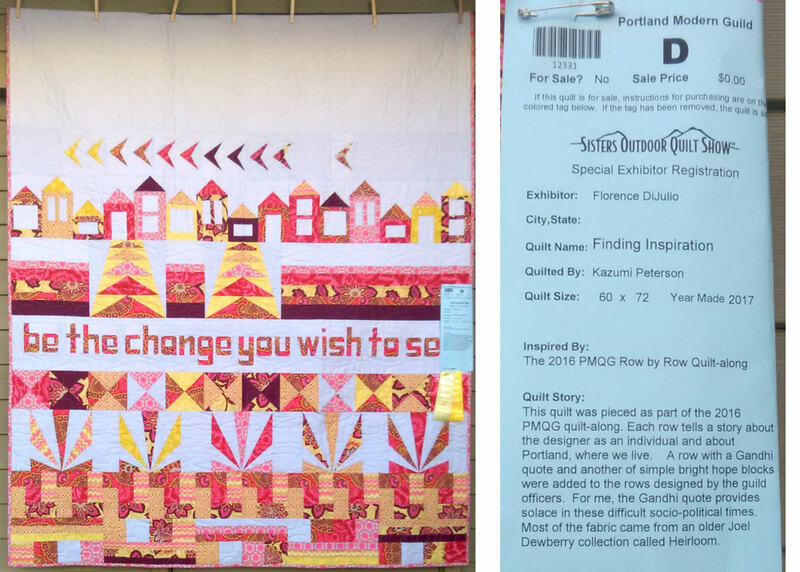 Our PMQG section was beautiful too – many of the Row by Row quilts made last year were on display. 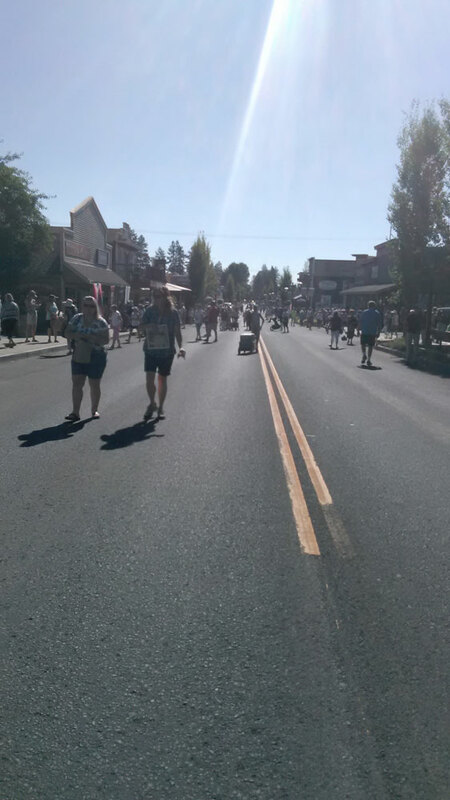 I was able to see many people there and meet a few new friends too! I really enjoy meeting people in real life that I’ve only ever met online. It’s part of the reason I really wanted to go – I usually feel a little left out when my body does not have the allowance that others’ have. 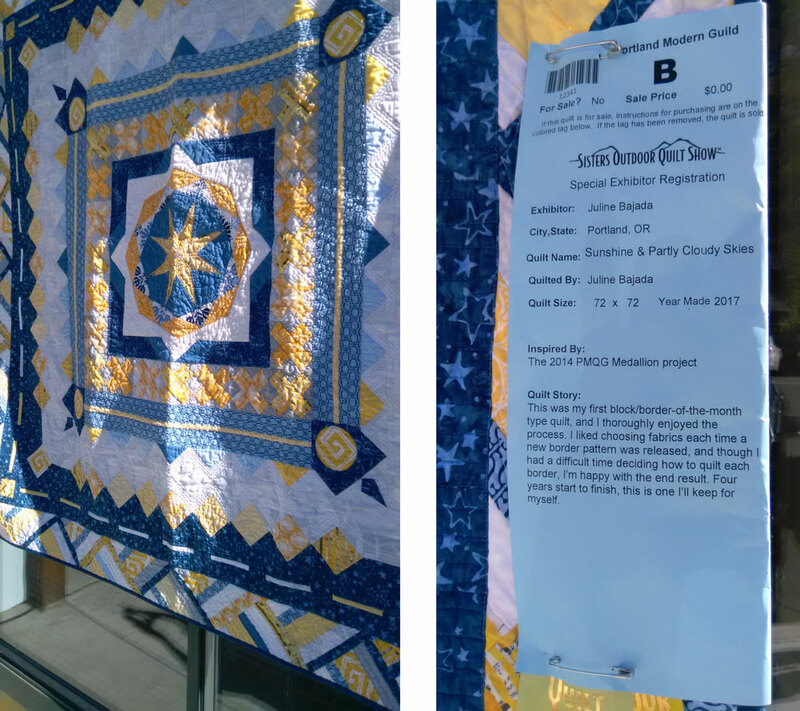 So I had a lot of fun talking to people and meeting new friends… and seeing some amazing quilts to boot! Around noon my body started to give way a bit – I started getting tired. Exhausted tired, the kind where you could just fall asleep in the middle of the road if the sun wasn’t glaring down on it right now- kind of tired. Then I started some swelling from ankles and elbows down, and my feet started to have nerve pain, and I knew it was time to go. It was only 12:30-1pm when I left… and there were a few more people I wanted to see and talk to while I was there – but I was fading fast, and I knew I had a long drive ahead of me, so I decided to leave. I was a little tired while driving, but I got to a rest stop about an hour out of Sisters and stopped and ate some food, drank some water, and stretched… then laid down on the grass in the shade under a tree and closed my eyes for a bit. That little pit stop allowed me to get home without stopping again, so I was home by 5. I said hello to my husband, ate a little and fell asleep. There were so many people in Sisters who seemed older, or with health problems… or both. I always wonder how much planning goes into their trips, how do they do it? Is it weird to be so jealous of an able body? I don’t feel I’m that feeble, yet these events are really hard to recover from, so maybe I am…? It certainly colors my future a certain way – and is a little saddening. So… onto some more positive thinking! I’ve been working on some hand work – La Passacaglia to be exact. I’m only doing a few rosettes for a charity quilt. This pattern is really intense using a pentagon for a base shape rather than a hexagon. There are a lot of small pieces – I did one that was English Paper-Pieced, and one where I traced the shapes on the back of the fabric and stitched them together with a running stitch and Y-seams. The one without EPP went together really fast, so I’m trying another that way using a different size. 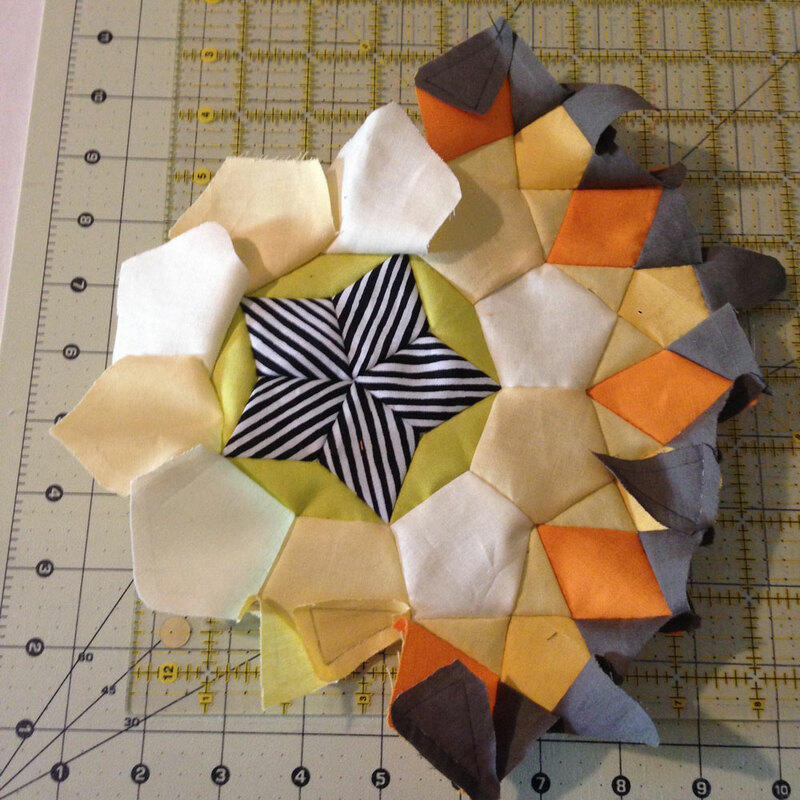 I have some ideas that are still incubating for this kind of piecing… I hope they lead me to something cool! I’ll be sharing more soon!